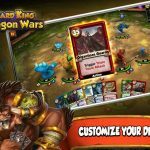 Card King: Dragon Wars, an iOS card battle game by Crooz, allows you to collect dozens of creatures, which you can use to create a formidable deck that could beat both the computer AI and other human players in the arena. And if you want a formidable deck, you also want an impressive lineup of characters in your team. Evolving and powering them up are two ways in which you can make your existing creatures more impressive; the former pertains to changing their form at the cost of resetting their experience back to Level 1. 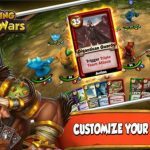 Still, the pros of evolving outweigh the cons of it, and if you need some help in evolving and powering up your creatures, we suggest you check out these Card King: Dragon Wars tips and hints. What you need to do here is to choose one creature to be powered up, and choose five material creature cards at the most for your sacrifices. These should be the cards you no longer need or want, as sacrificing them erases them forever. You will also need to have some Dragon Coins on hand to power up a creature. This is usually an inexpensive process, but it’ll cost you more if you’re giving the benefactor card a lot of experience. The Dieclops’ maximum level is 1, and once sacrificed, it’s going to give the benefactor card a ridiculous amount of XP. We’re talking more XP than material cards, no matter how rare they are. But with all those experience points comes a whole lot of coins, so be sure you’ve got enough Dragon Coins handy if you’re planning to sacrifice the Dieclops. Always remember that a card needs to be fully maxed out if you want to have it evolved. You also have to match runes based on color and based on rarity; rare cards usually need to be evolved by rare rainbow runes. Evolution is costlier than power-ups, so having a good reserve of Dragon Coins is necessary when evolving a card! Need more tips and tricks for the game? 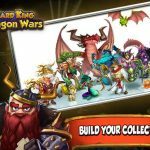 We advise you to check out our strategy guide for Card King: Dragon Wars, as well as our Battle Arena hints and also our list of tricks on how to get rare cards in the game.